Members of the Izu-shi Friendship Society hosted an o hanami cherry blossom viewing picnic in Cottonwood Falls Park recently. 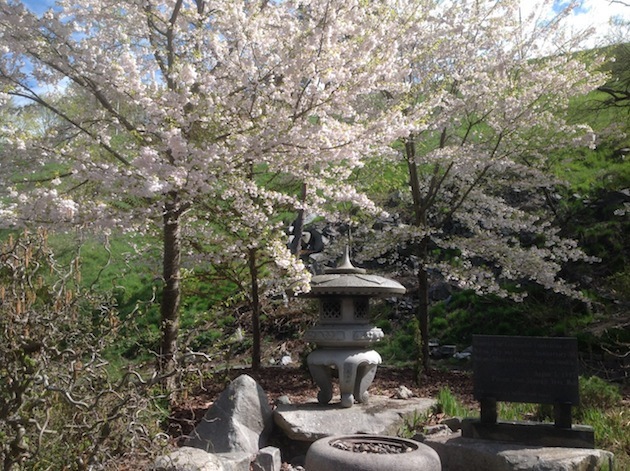 Members of the Nelson sister city Izu-shi Friendship Society hosted an o hanami cherry blossom viewing picnic in the Japanese garden in Cottonwood Falls Park recently. Newly-chosen president John Armstrong (far left) said these picnics are very popular at this time of year in Japan, though they usually include beer or sake, which this group lacked. Jim Sawada (third from right) told a humorous story about building the garden, Margot and Bernie Zimmer (back, third and fourth from left) shared their family’s experiences visiting Izu-shi (formerly known as Shuzenji), and they all sang the Japanese song “Sakura” (cherry blossoms).